Have you fallen and broken your hip? Have you torn your labrum while doing gymnastics? 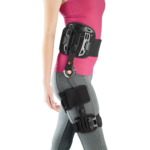 Whatever your hip injury, Highland Orthopedic Supply has a brace or therapy product to aid in your rehabilitation. From post-op braces to temperature therapy units, we have a product that suit your needs. Shop our selection of leading manufacturers such as Breg, DeRoyal, Everest & Jennings, Lumex, and Medi-Stim. Not sure which product is best for you? Call us at 1-800-583-3771. We will be happy to assist you.